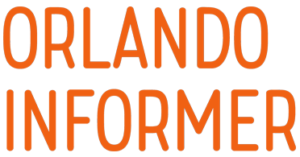 To some guests, Universal CityWalk may just be that one place standing between their parking space and the rides at Universal Studios Florida and Islands of Adventure. But to me and many other highly enlightened guests, CityWalk serves a greater purpose: it’s the perfect destination for good times with friends and a wide selection of entertainment, drinks, and dining. 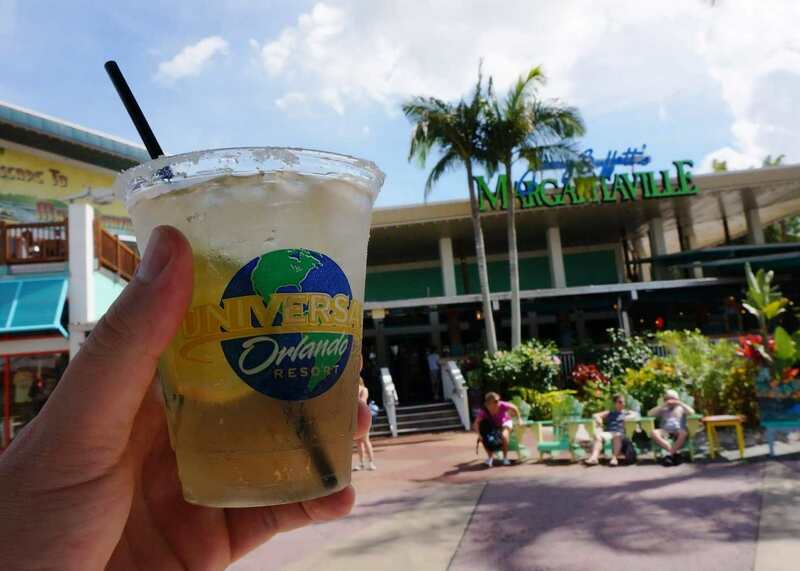 Although the prices of adult beverages at Orlando’s theme parks are often quite high, we find some very delicious drink deals at Universal CityWalk. In this week’s BIG 5 blog post, as we celebrate the current version of CityWalk before everything changes in 2014 (more on that at the end of the post), we count down our top five favorite drink deals. Keep in mind that these are not necessarily the least expensive deals, but rather, the ones we simply enjoy the most! There are several food & beverage kiosks, including one near Margaritaville, where you can get a number of mixed drinks in a CityWalk souvenir glass for $9.75 with refills for only $7.75. You can get a margarita, classic long island iced tea, rum punch, or electric blue lemonade in this souvenir cup, and all are offered at the discounted refill price. Universal CityWalk refillable souvenir cup. I personally recommend trying the rum punch because it is very tasty and plenty strong. Most of these kiosks also offer snacks, including turkey legs, hot dogs, chips — you get the idea. In addition, CityWalk recently opened a craft beer kiosk close to Margaritaville too. While we can squabble over whether their selection really is “craft beer”, at only $6.25 a pour, we can agree that the price is right (for a theme park). For the rest of this month you can visit Cigarz, located right by the CityWalk food court, and purchase a 32 oz draft beer starting at just $8.00. The beer goes up in price if you choose a seasonal or craft beer, but never goes over $10.00. I generally get the seasonal Sam Adams and usually pay between $9.00 and $9.50. 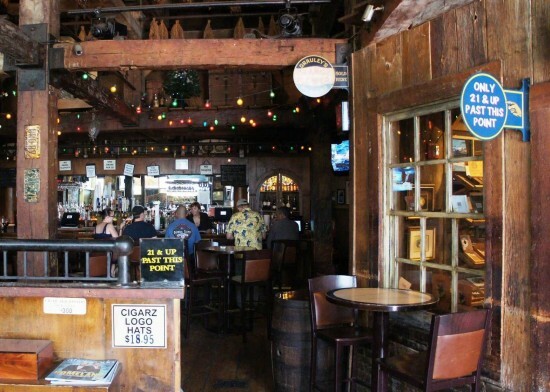 This bar is a bit off the beaten trail of CityWalk, and can be filled with cigar smoke, but those who venture in will experience a true “local’s scene” and some of the best drink deals at CityWalk. Sadly, it been all but confirmed by Universal Orlando that Cigarz will close at the end of 2013 (more at the bottom of the post). We are certain its replacement will offer a strong entertainment experience — but we can only hope that it will offer pricing that is just as good. Located across from Margaritaville is the Lone Palm Airport. 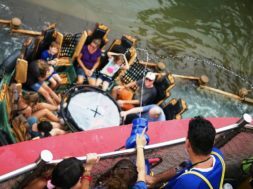 The star of this tiki style bar is the Hemisphere Dancer – Jimmy Buffet’s very own seaplane! Another recently discovered star attraction at this bar is called the Loaded Landshark. The bartender will pop open a bottle of Landshark beer and top it off with a shot of Margaritaville’s lime flavored tequila. 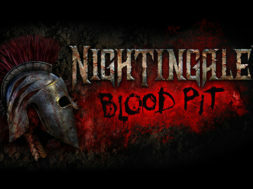 It is simply delicious and only $8.25 (great price for a beer and a shot at a theme park). View from Lone Palm Airport. 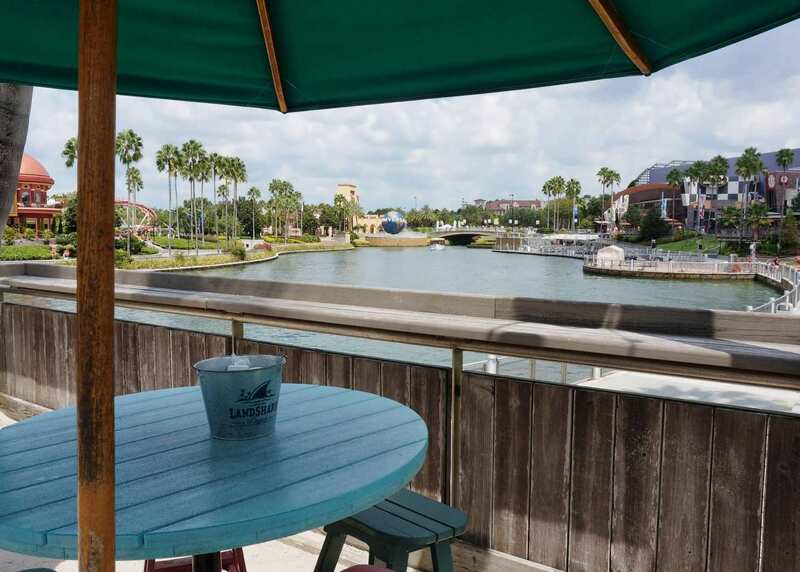 Sit back, relax, and enjoy your Loaded Landshark with a healthy dose of Jimmy Buffet beach music and the beautiful Floria sunshine. By the way, if beer isn’t your still, our back up recommendation is the perfect margarita! Okay, so we’re fans of margaritas! That’s why our number two selection is the new flight at Margaritaville, featuring four different flavored margaritas: Who’s To Blame, Blueberry Pomegranate, Fin’s To The Left, and Last Mango in Paris. It’s the ideal option if you are having a hard time deciding which of the many specialty drinks to enjoy (or if you just want to imbibe more while looking like you’re actually a discerning drinker). You can order one for $16.95, which is a great deal considering that margaritas on the menu run around $12.00 each. 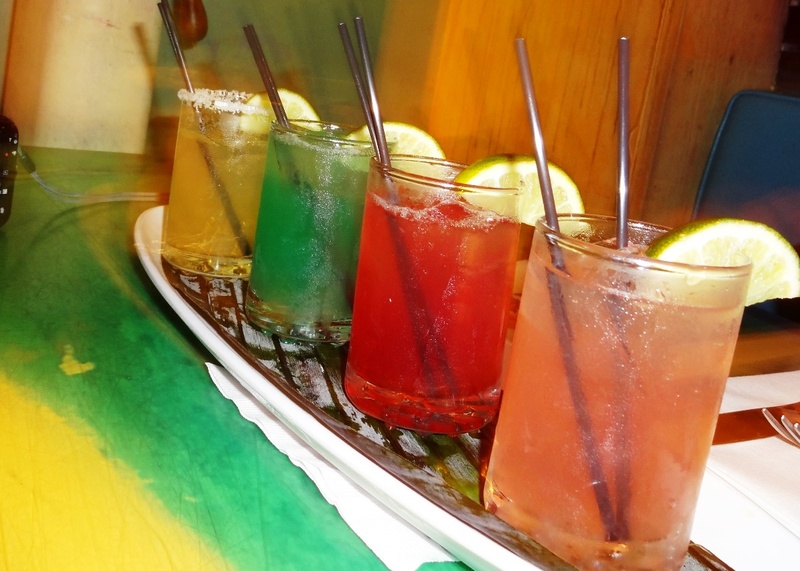 I can’t think of anything better to go with the tropical-getaway atmosphere of Margaritaville than four very delicious margaritas! 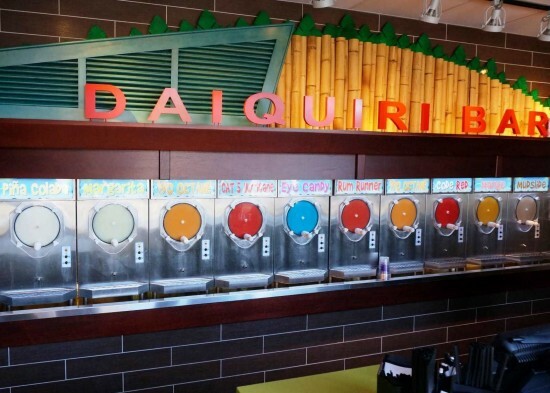 By the way, did you know that Margaritaville has a completely refreshed menu? If you missed OI contibutor Dani’s blog post about it last week, you can check it out right here. At Fat Tuesday, you will find a number of daiquiris that are so inviting, I’m longing for one as I write each of these words. 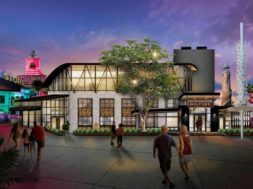 In fact, the CityWalk venue serves up so many delicious flavors — and the option to mix up your own new innovation — that the icy happiness seems like it will never end. I personally recommend trying the Pina Colada, or, if you are feeling a little more adventurous, try out my favorite flavor pairing: the peach Bellini and Eye Candy. 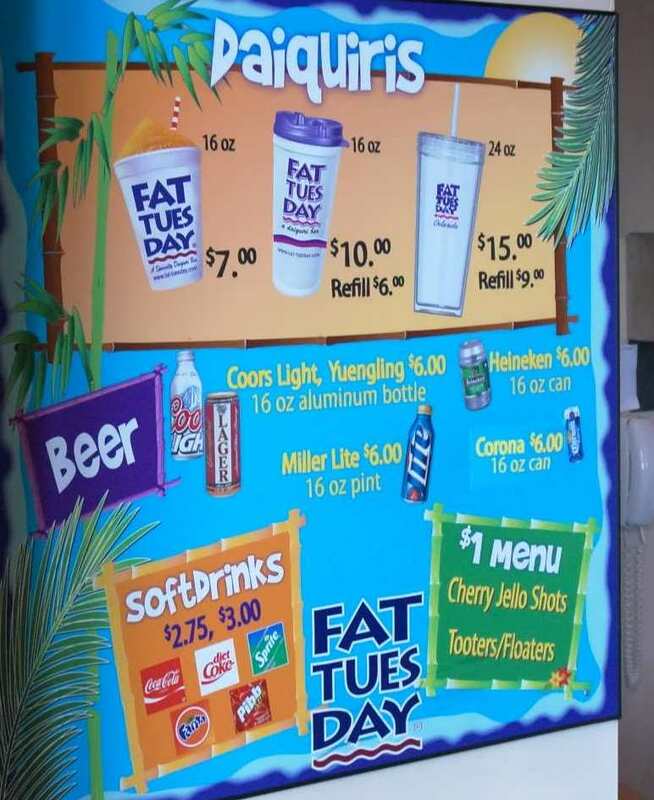 But aside from the flavors, what makes Fat Tuesday my number one spot for a drink deal at CityWalk is the souvenir cup and refill: a 16 oz cup filled to the brim of your favorite daiquiri is just $10.00, and each refill afterwards is $6.00 (here are all the cup prices). You can also add an extra shot for just $1.00. And the deal doesn’t end there, because the souvenir cup you buy at Fat Tuesday can be used for discount refills at the mini-Fat Tuesday near the CityWalk lagoon (pictured at the very top of this post), and it can be used for discount refills at any of the 50 Fat Tuesdays around the country. If only Orlando was a little closer to New Orleans, so we could try the seasonal Cajun Eggnog flavor! Pat O’Brien’s features a fantastic deal on their signature drink, the Hurricane. 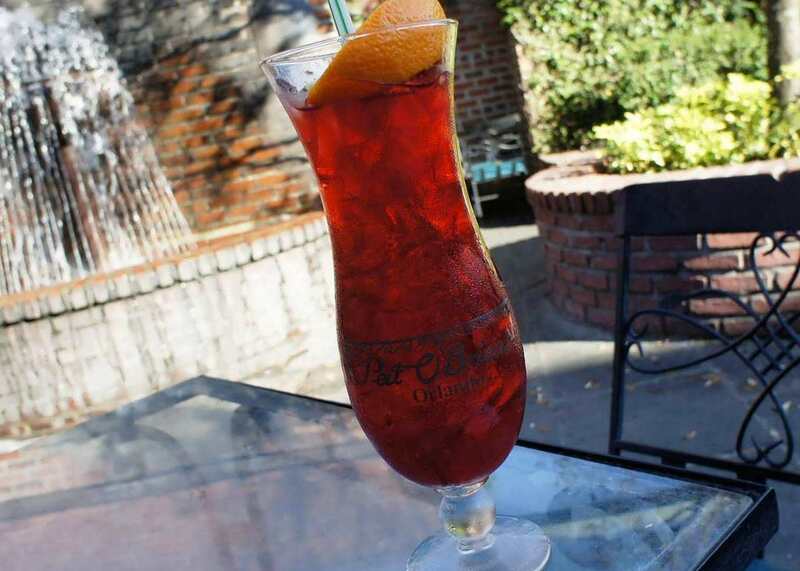 During their happy hour, the delicious rum-based drink is only $8.00, compared to its normal pricing at $11.49. But plan accordingly, because the happy hour deal is only offered Monday through Thursday, from 4:00 to 7:00pm. In addition to the great price of the Hurricane, Pat O’Brien’s also offers some of their appetizers for only $5.00 during happy hour. After a few Hurricanes, here’s a fun fact you can impress your date with: Did you know that the Hurricane is the only drink to have a style of glassware named after it? Yep, a Hurricane can only (officially) be serviced in a Hurricane glass. 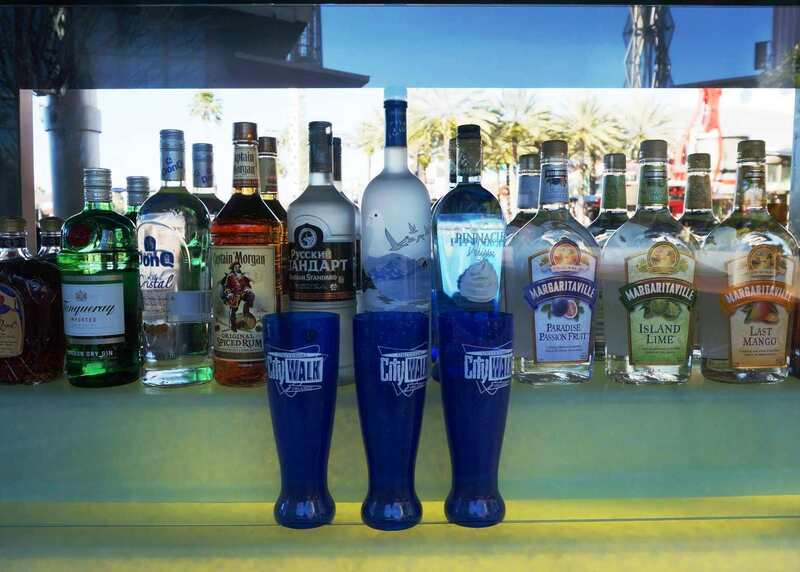 No matter which one of these drink deals you choose to indulge in, I guarantee you will have a blast while visiting Universal CityWalk. And once you’re done with my list, there is more to explore — like the fan fueler at NASCAR Sports Grille or the selection of sake at Fusion Bistro Sushi & Sake Bar. Hey, I couldn’t include every drink special on this list, but if you insist, I’ll keep researching! 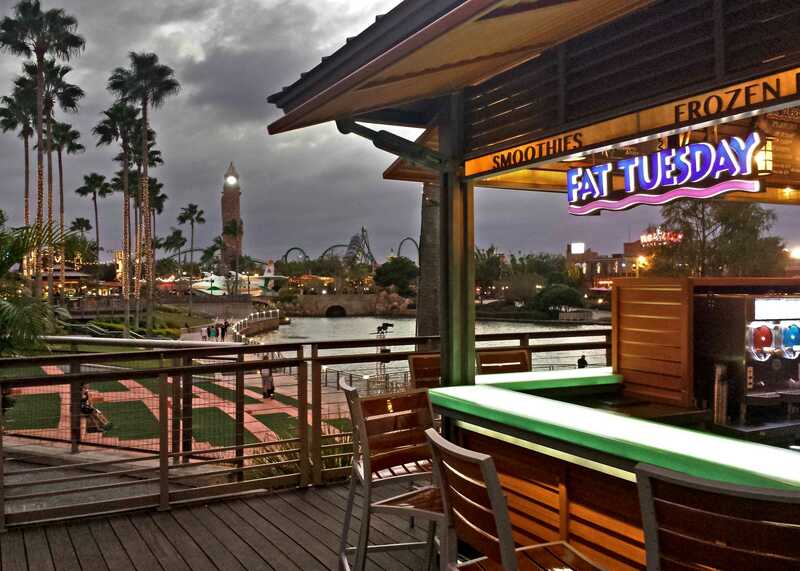 If you enjoyed this article, check out all of the BIG 5 blog posts on Orlando Informer, including the top five outdoor bars at Universal Orlando. So what’s happening at CityWalk in 2014?? As of Wednesday, December 12, we don’t know for sure, but rumors say that several venues are closing soon, such as Cigarz and TCBY. At the same time, the resort is set to announce up to five new venues scheduled to open in the first half of 2014. There is a press event tomorrow, and we’ll have full coverage on our site in a special Thursday evening edition of our Rumor Round-Up. 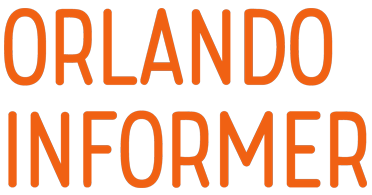 Also some times you can find a bogo hurricane coupon, check the concierge desk at the resorts. Fat Tuesday’s is a favorite of mine. I like the 5 O’CLOCK SOMEWHERE at Margaritaville. Plus if you’re footsore, nothing beats spending an hour or two people watching from one of the bars in CW. I have a question I read rumors tbcy, cigars, and the candy store are all closing is something big taking over those spots? Thanks for the great tip. Love these new “flights” that seem to be big at the theme parks? My favorite Citywalk drink has to be Incommunicado at Margaritaville.